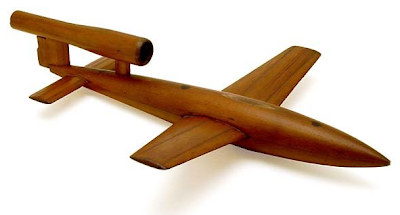 Exceedingly rare wood wind tunnel model from the late 1930s. Even rarer since it shows light markings on top where an experimental cockpit for a pilot could be located. Manned prototypes were experimented with late in WW II with Hanna Reitsch, Hitler's personal pilot, testing to see why test pilots were unable to land and had died in landing attempts. By simulating landings at high altitude, she found that the high stall speed had caused the test pilots with little high speed experience to attempt their approaches much too slowly. This model is all wood, unpainted, with a metal screen in front of the intake. It is 22.5x15"x4.25". Amazingly, there are only a few tiny scratches & nick. Great condition for a wooden model over 70 years old.